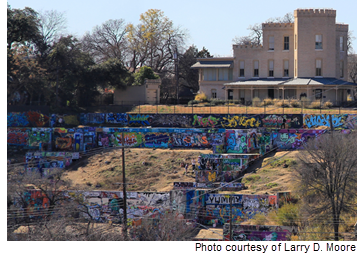 ​​ AUSTIN – The Historic Landmark Commission approved the demolition of the concrete walls and slabs at Graffiti Park. Officially known as the HOPE Outdoor Gallery, the graffiti-covered concrete walls and slabs at 1012 Baylor St. opened in 2011 to muralists. The concrete walls and slabs that evolved into a public canvas were leftovers from a failed multi-family development from the 1980s. The HOPE Outdoor Gallery will move to 9507 Sherman Rd. on Carson Creek Ranch in east Austin. The new location will provide more structure to the gallery and more space for artists. It is expected to open by the end of 2018. One of the concrete slabs from the old park will be moved the new location as a memorial.